*If easy migration mode is selected, there is no assignment process. Instead, all folders are classified as organisational units to create the structure from version 7. Why are tags and OUs assigned? 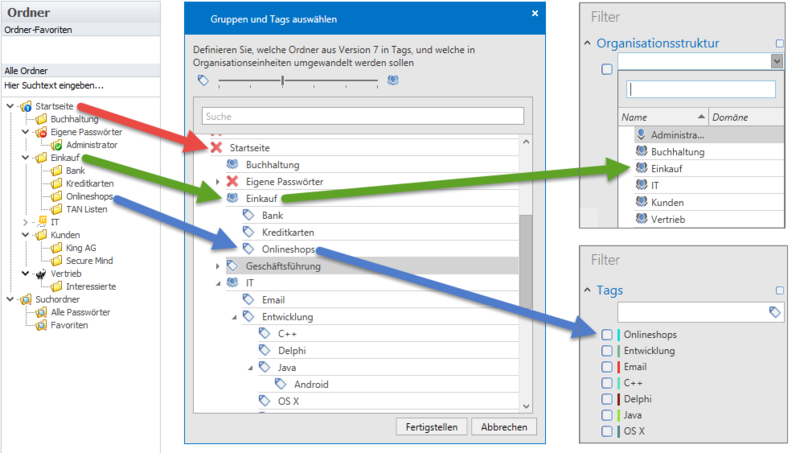 The slider is used to define how far up the hierarchy folders will be converted into organisational units during the migration – all underlying folders will be converted into tags. Thus a certain pre-selection can be made, which can then be manually refined. 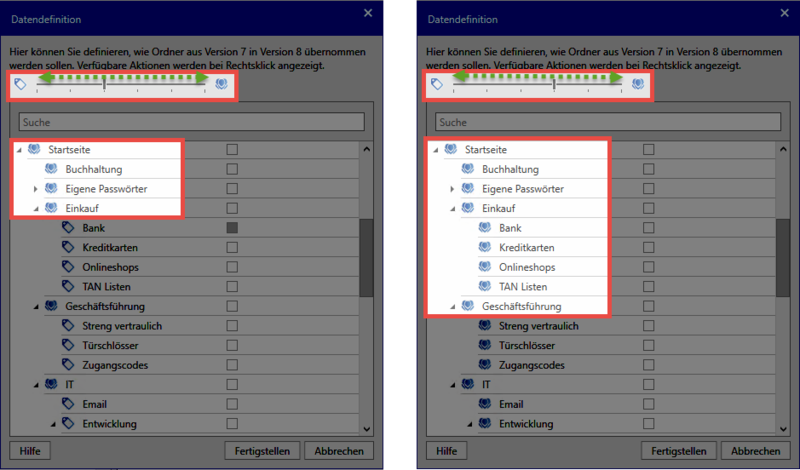 Repeated clicking will switch between tag, organisational unit and unallocated folder. *If the slider is moved fully to the right, all folders will be migrated as organisational units. The complete structure from version 7 will thus be copied over. *Home and the search folders do not need to be imported. Importing personal folders is also not recommended. In this case, the records are assigned to the organisational unit of the respective users. The migration process also provides you with the opportunity to clean up all folders with no content. !The user carrying out the migration can view all of the folders on the database during the process. The records themselves cannot be viewed by the user. It is also possible to include the folder names in the record description. For this purpose, a corresponding button is provided for every folder. This option can be activated for all folders via the context menu. Press the Finish button to transfer the data to the database. The migration can take several hours depending on its scope. If Master Key mode has not been selected, the imported users will receive randomly generated passwords via email and can directly log in. At the first login, these passwords must be changed. If configured, the user who carried out the migration is immediately deleted.